Bacău County (Romanian pronunciation: [baˈkəw] ( listen)) is a county (județ) of Romania, in Moldavia, with its capital city at Bacău. It has one commune, Ghimeș-Făget, in Transylvania. In 20 October 2011, it had a population of 616,168 and the population density was 93/km². Vaslui County in the East. Harghita County and Covasna County in the West. 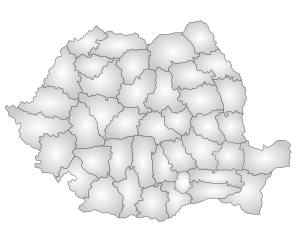 Neamț County in the North. Vrancea County in the South. The county of Bacău was one of the most industrialized regions in the communist period and it remained Moldavia's most important industrial center ever since. There are two large oil refineries at Onești and Dărmănești. Following the collapse of the communist regime, Bacău continued to be the region's most important GDP supplier, but the county became more famous for the controversial figures involved in local economy than for its performance. The chemical and oil industry. In Bacău county there are important reserves of oil and salt. Also coal is exploited. The cities of Bacău and Onești. Bacău became famous after electing Ilie Ilașcu of the Greater Romania Party as their Senator, while he was held in prison in Transnistria. The building of the Bacău Prefecture in the interwar period. Between the world wars, Bacău County had a different territorial extent. 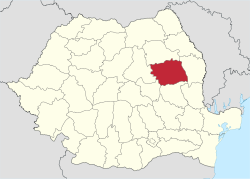 The county was located in the east central part of Greater Romania, in the center of Moldavia. Its territory included the central part of the current Bacău County. It bordered on the west with the counties of Trei Scaune and Ciuc, in the north with Neamț and Roman, in the east with the counties of Tutova and Tecuci, and in the south with the county of Putna. 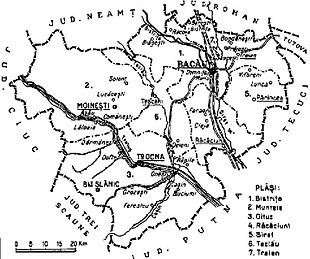 Map of Bacău County as it existed in 1938. According to the 1930 census data, the county population was 260,781, comprising 88.6% Romanians, 5.3% Jews, 3.3% Hungarians, as well as other minorities. From the religious point of view, 75.8% were Eastern Orthodox, 18.1% Roman Catholics, 5.5% Jewish, as well as other minorities. In 1930, the county's urban population was 50,342, of which 70.1% were Romanians, 23.9% were Jews, 2.2% were Hungarians, as well as other minorities. From a religious point of view, the urban population consisted of 64.9% Eastern Orthodox, 24.4% Jewish, 9.3% Roman Catholic, as well as other minorities. 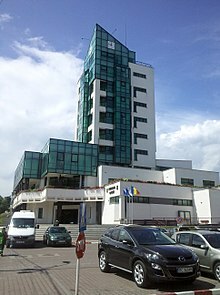 Wikimedia Commons has media related to Bacău County. This page was last edited on 21 January 2019, at 03:33 (UTC).